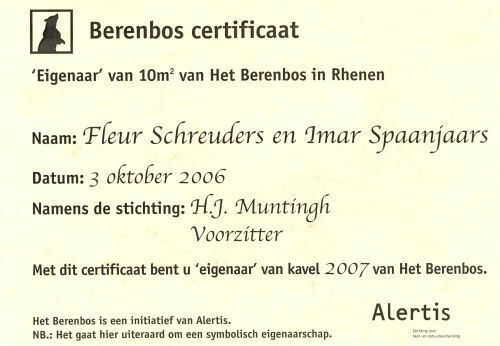 A couple of days ago I received my certificate that states that I am now the owner of zoo in the Netherlands. You don't believe me? 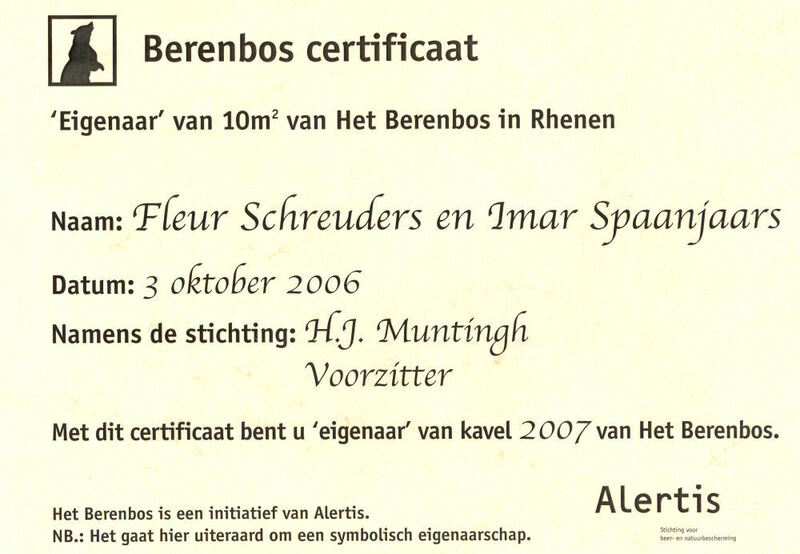 Together with this certificate, I get a big sign in front of the entrance of Het Berenbos that states my girlfriend's and my name as official owners of the zoo. Pictures of the sign will soon follow. If you can read Dutch, you may have noticed the catch. I am only a symbolic owner of the zoo, and I only "own" 10 square metres. Het Berenbos is part of a zoo called Ouwehands Dierenpark Rhenen and is a little forest where bears live. Most of these bears have been freed from cruel situations where they were tortured and mistreated. Alertis, the organization behind Het Berenbos locates these bears, tries to free or buy them and brings them back to the forest where they can live a peaceful life with fellow bears. To fund their activities, they "sell" symbolic parts of the forest to sponsors. As a sponsor, you get free tickets to the zoo, and you're invited for the "bear party" in the zoo once a year. Obviously, I didn't do it for the free tickets or the party, but for the well-being of the animals. If you want to know more about Alertis and Het Berenbos, check their website in English or in Dutch. They're a great organization and do a great job, so I am one proud owner of Het Berenbos. You are not a very good Comedian Imar,But your are definitely a very good developer.